It’s funny how someone’s off-handed comments can change the trajectory of your day. In this last Smitten Kitchen email she mentioned something about mushroom filled cabbage rolls in a Greek Avgolemono sauce (it’s an egg-lemon juice concoction). Anyway, Ms. Perelman went on to describe some gorgeous recipe involving wrapping cabbage rolls while I got busy busy talking with my best friend Google. It took a long time to find a mushroom-filled recipe and even then I needed to find an additional recipe for that sauce. At the end of the day, these were a disappointment. C thought the rolls had too much oregano, which blocked the sweetness of the cabbage. I thought a little salt and pepper increased the flavor, but the texture of the mushrooms…blah. I think if I were to make this again I’d skip the step of putting the sautéed mushrooms and onions in the food processer. I think it’d be better with sliced mushrooms and perhaps allowing the onions to caramelize before adding in the mushrooms, instead of the other way around. Maybe even a touch of white wine woulda been good…and even though I halved the requested breadcrumbs, I think I should’ve skipped them altogether. On the positive side, the chicken was EXCELLENT as was the side dish of Steamed Broccoli Tossed with (defrosted) Spinach and a Tablespoon of Garlic Confit. The Avgolemono sauce though? We ended up pouring the lemon sauce over everything – it was THAT good. Don’t they look all pretty? All laid out and everything? 4 Boneless, Skinless Chicken Breasts **Mine were quite large. I cut the tenderloins out, turning the 4 pieces into 8 (4 thick, 4 thin). Pam (or some other baking spray) – Feel free to use olive oil or margarine if you’re so inclined. 1- Oven to 350ºF. If you haven’t already, and if you’re so inclined, divide thick chicken pieces into two pieces. 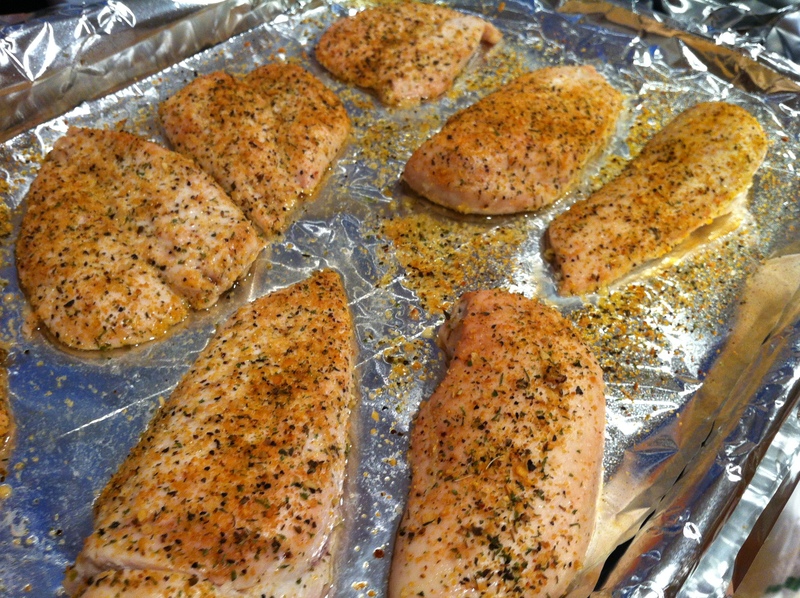 2- Shpritz a baking sheet with Pam, lay your chickens out, lightly shpritz them with a touch of Pam/olive oil, and then sprinkle lightly with your seasoning. 3- Whack your pan into the oven for about 30 minutes. Check the thickest parts of the chicken – if pierced the chicken should run clear (I generally don’t trust this and end up cutting into the chicken to make sure it’s cooked all the way through). TaaDaa! OH! Before I forget! 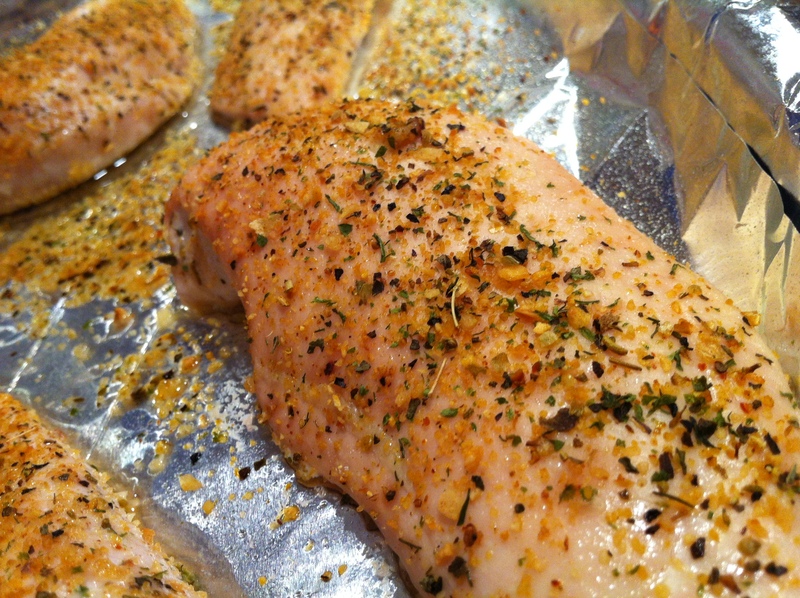 Let your chicken rest under a foil tent for about 10 minutes after you pull it outta the oven. The time will allow the juices to redistribute and be all yummy. We like that. 1 (defrosted) box of Chopped Spinach **I dumped mine into a microwave safe dish and whacked it in the microwave for 5 minutes. 2 Tablespoons Garlic Confit **If you don’t have any on hand (WHY NOT?!?! ), you could sub in 3-4 whole Garlic Cloves gently heated in Olive Oil. 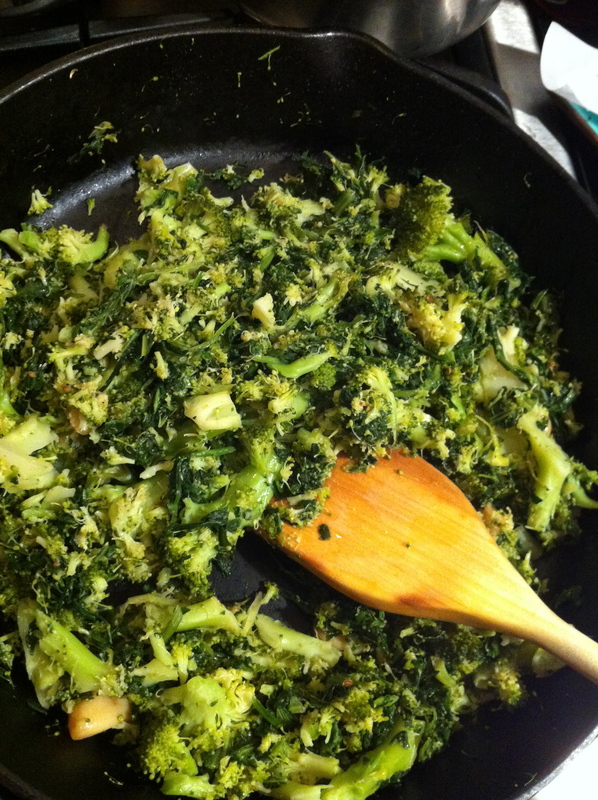 2- I dumped the spinach into a large skillet, added in the (overcooked) broccoli and ladled on the Garlic Confit – complete with several garlic cloves (SOOOOOO good!). I added in salt, pepper and coriander until the flavors made me happy. As should you! 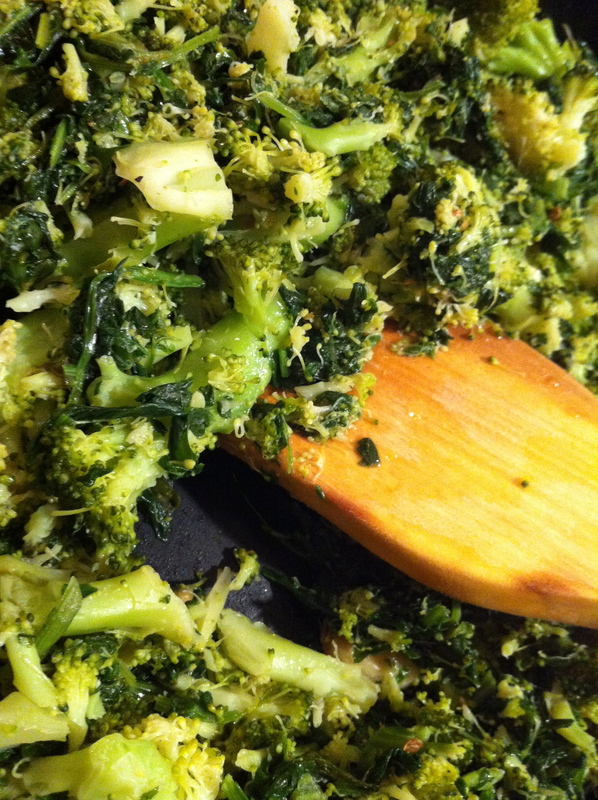 2/3 cup Breadcrumbs **I used a little less than 1/2 cup and think THAT was too much. 1/2 teaspoon Oregano, dried. **SKIP IT. Chicken Broth **I used no-chicken chicken broth, about 3/4 of the box = about 3 cups. 2- Fill a large pot with salted water and bring it to a boil. Peel 6-10 of the large outer leaves off the cabbage head and plunge them into the boiling water. Leave them for 10 minutes then USING TONGS, NOT your fingers, pull the leaves out and lay them flat on a kitchen towel or a paper towel or whatever you use to dry things. 3- Heat a large skillet over medium heat. When a few sprinkles of water sizzle away, it’s time to add the mushrooms. Mushrooms give off a lot of water and don’t need butter or oil or anything until AFTER they’ve released their liquids. You can add in butter if you’d like, but I skipped it. I added in the onions afterwards. Let them cook in the mushroom juice. When everything was done I turned off the heat and let it cool a minute. 4- Scoop everything into your handy-dandy food processor and whirr away. Add in the breadcrumbs and salt and pepper and whizz again. You want everything mixed up but not pureed. **Actually, I thought this step was a HORRIBLE idea. Skip it. I think the onions and mushrooms would’ve been better on their own. If you’re interested you could throw in some sour cream or some white wine or something. That’d be nice. Make sure you add in your salt and pepper though. Important seasonings. 5- Now it’s time to ROLL! 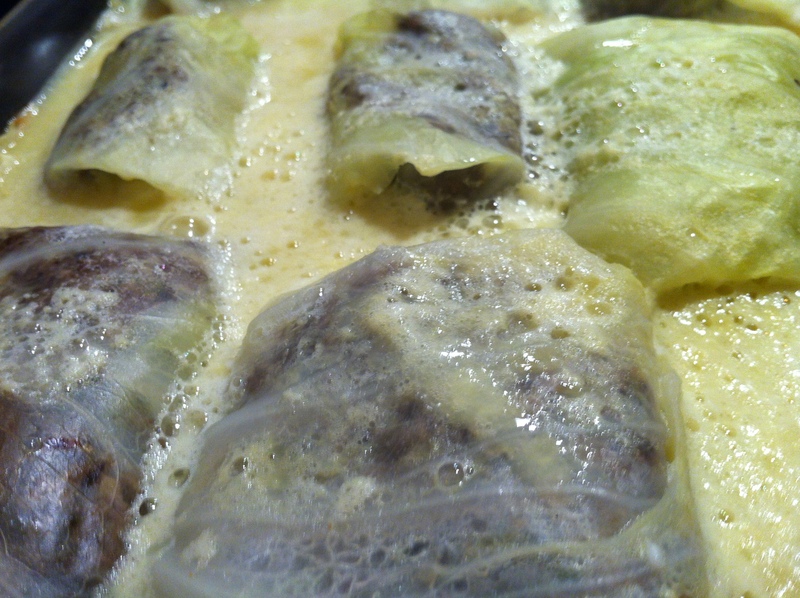 If your cabbage rolls aren’t dry, pat them dry and get ready. You’ll scoop a big heaping spoonful of the mushroom filling onto the base of the cabbage leaf, roll it up over the filling, bring in the two sides and then continue rolling. Place it seam side down in a casserole dish that you’ve lined with the torn cabbage leaves (the ones that didn’t make it). 6- Pour your broth into the casserole dish until it comes half way up the sides of the cabbage rolls. 7- Whack your pan into the oven for 45 minutes. 8- OPTIONAL: If serving with Avgolemono Sauce, add it now-after it comes outta the oven, cover the dish and let it sit for ten minutes and then serve! The sauce was totally worth it. Broth **I used about 1/3-1/2 cup of the already-open no-chicken chicken stock I used for the Cabbage Rolls (Recipe Above). 1- Beat the egg whites until foamy. Beat in the egg yolks, the water, lemon juice and the broth, beating/whisking continuously. 2- Add the Avgolemono sauce to the dish being cooked, stir, cover with a towel for 10 minutes, then serve. **I made this ahead of time and shoved it in the fridge until I was ready to add it to the final dish. It was SO TASTY that we literally ladled this sauce over everything on our plates. End result: The chicken and broccoli/spinach combo were winners, as was the sauce. 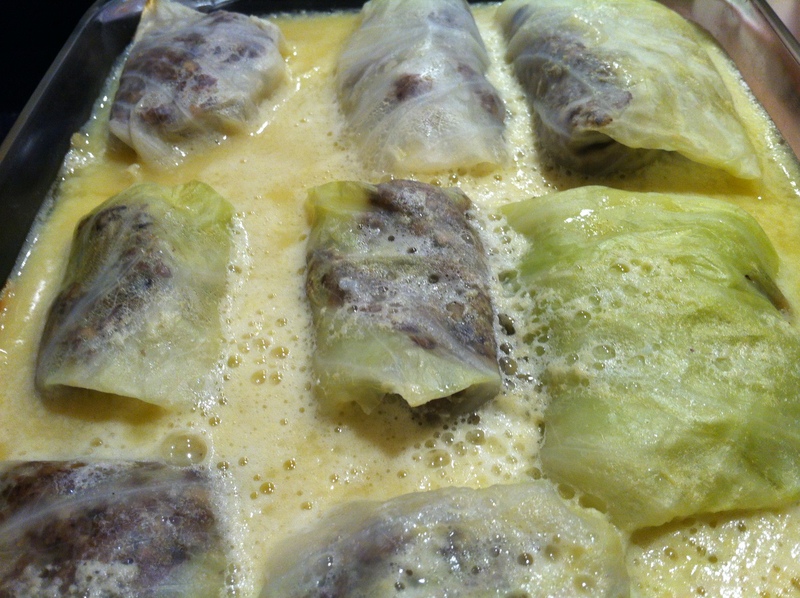 The cabbage rolls might have some possibilities…if I get bored one day maybe I’ll attempt making this again. Nah. Life’s too short to re-make bad recipes. oops, that’s -2 tbsp soya sauce! Tammy- confused! Marinate chicken in soy sauce, OJ & chicken seasoning? Or marinate in OJ & seasoning then add soy? Sorry, I got excited when I saw the Montreal Chicken Seasoning! 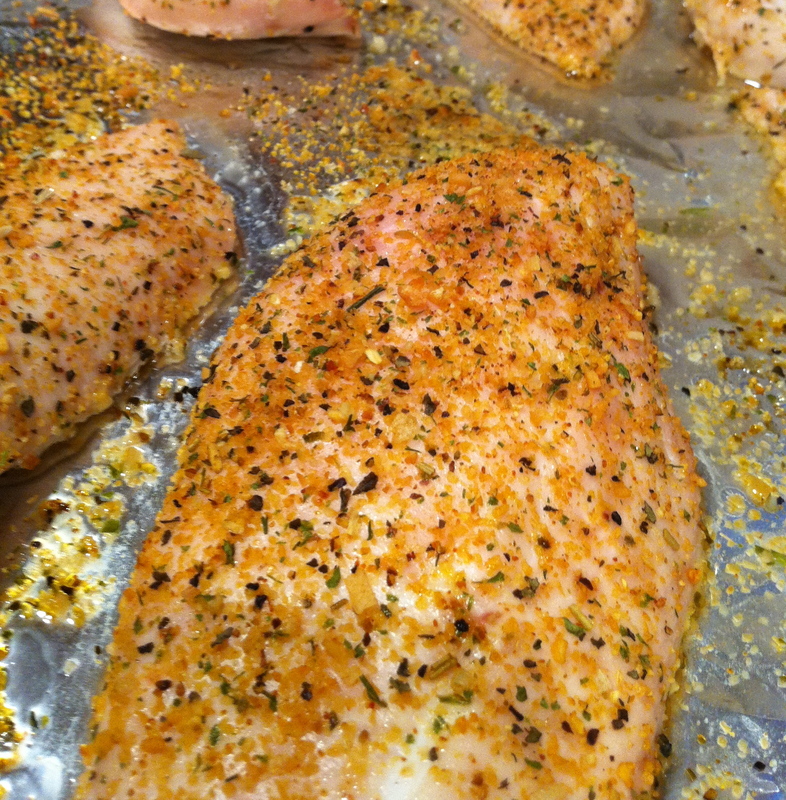 Marinate chicken in seasoning, soy sauce and orange juice, for at least an hour or overnight. You won’t be disappointed! I mentioned this to C – he’s a little excited for me to try this! Thanks! If your leaves are very large and thick you can cut out a portion of the thick stem to all easier rolling. Just be careful not to cut out too much or the leaf will split. You can also put the leaves into the freezer to soften them before rolling. I love to make a meatball stuffed cabbage roll in a sweet and sour tomato sauce. Yummy! B) Thanks for the freezer tip! How long will they need to be frozen for? C) I have a friend who used cold cabbage leaves to relieve pain from nursing. Cabbages are so useful, aren’t they?